This document is designed to help designers create AC systems for their Projects in HelioScope. AC wiring is an optional function of HelioScope, and it follows the same general principles as DC system design. 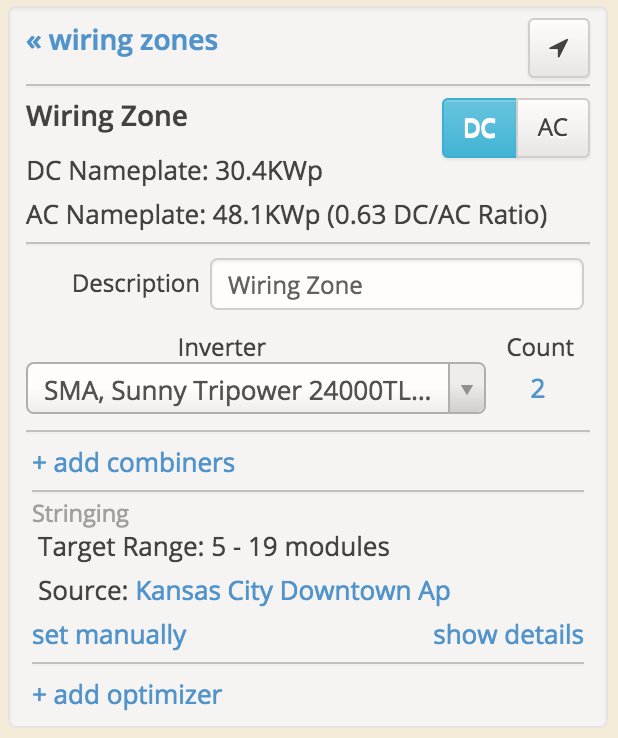 At the top of the electrical Designer, click “AC” to enable the AC design menu. The AC design in HelioScope models wire losses based on the resistance and current on the conductors each hour. Note that it does not incorporate transformer efficiency losses. As with the DC design, AC conductors are drawn automatically between components. Conductor lengths are calculated with two conductors over the distance, the same way that DC conductor distances are calculated. This is appropriate for single-phase AC runs, but for three-phase or three-phase wye circuits, the AC conductor quantities should be multiplied by 1.5 or 2.0 respectively. B. AC Panel (optional): electrical box that combines one or more sources into a single circuit with larger conductors. When selected, these can be dragged around the map to adjust the conductor distances. D. PCC: Point of common coupling, also known as point of grid connection. This can be dragged around the map to adjust the conductor distances. Note that any single Design has just one PCC point. 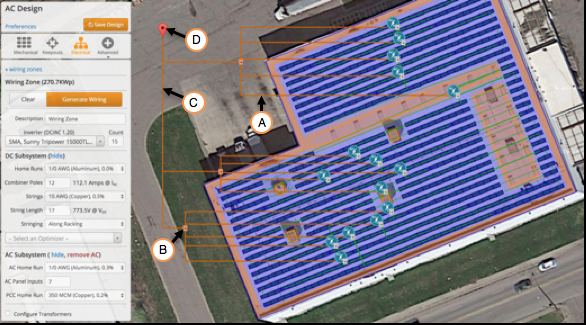 Note that HelioScope will divide the inverters across the AC panels as evenly as possible. For example, the above project has 15 inverters. Choosing seven AC panel inputs will result in three AC Panels (15 / 7 = 2.1, which rounds up to 3), and then HelioScope will split the inverters into 3 groups of 5. Choosing 8 AC panel inputs will result in two AC Panels (15 / 8 = 1.9, which rounds up to 2), and HelioScope will split the inverters into 2 groups of 7 and 8. For more control over the design of an AC system, HelioScope can configure transformers. Efficiency and yield impact. Note that transformers will change the operating voltage of the system, and therefore the wiring losses (since higher operating voltages lead to lower operating current), though the transformer efficiency is not currently calculated in HelioScope. Check the “Configure Transformers” box at the bottom of the dropdown menu to open the Transformer section. The transformer design works by defining the voltages at each stage of the AC circuit. This includes the output voltage of the inverter, the output voltage from the AC panel (if applicable), and the interconnection voltage. Then, whenever there are changes in the voltages (defined by the user), a transformer will be added. Note that you do not directly add transformers to the design. The output voltage of the inverter defines the AC Home Run (A) voltage. If the output voltage of the AC Panel is different, as defined in the “Panel Transformer” (C) drop-down menu, then HelioScope will include transformers at the AC Panels. Similarly, if the grid voltage at AC Interconnection (D) is different from the voltage in range C, then an additional transformer will be included at the PCC.